9-5 employees all around the world are notoriously known for being hard workers and rarely cashing in on their vacation days. The Westin Hotels and Resorts think that habit needs to change and that it's time for Americans to pursue their dreams and swim with dolphins, all on the company dime. 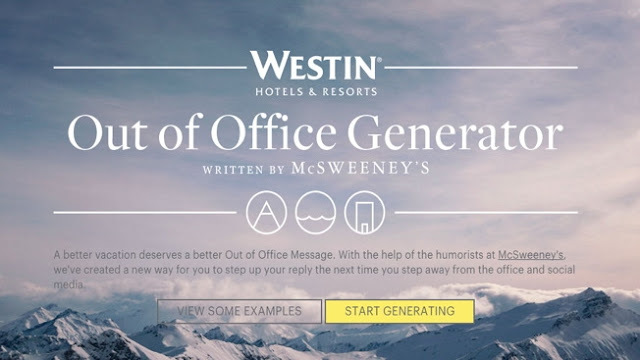 The Westin Hotels & Resorts recently launched a new campaign that generates witty and satirical out of office emails for Westin Hotel patrons to use. See the video below for a humorous example! Westin Hotels have been struggling to stay relevant in the recent years simply because millennials do not travel the same way their older generation counterparts do. With the rise of services like Airbnb and the growing trends of backpacking, staying in hostels, and traveling like the locals do, traditional hotels like the Westin are becoming less and less relevant. As a millennial myself, I can say that staying at the Westin Hotel simply isn't trendy anymore. I think this is a great way to attract millennials because millennials are obsessed with these sarcastic and witty messages (the popularity of Internet memes confirms this theory) and the Westin perfectly employs this strategy.